This is a pin. It is hand-knitted with fine silver .999 wire. 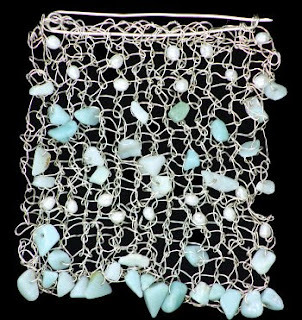 Knitted into the pin are amazonite nuggets and freshwater pearl fragments. Everything in this pin is custom hand-made for the piece, including the pin itself! If you would like a similar piece of jewelry, or need a unique piece of jewelry, contact us! This bracelet was made to match yesterday’s ring. The three center oval stones, is yellow-green serpentine, to match the ring. The white squares are buffalo bone, which is wrapped with copper wire. The center stone has a copper band around it. 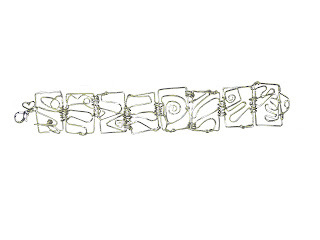 This band is decorative with bubble shapes stamped into it, along with a few cut-out holes to add dimension. As usual, all the wire you see was hand formed. If you would like a similar bracelet, or a unique piece of jewelry, contact us! Today’s highlighted piece is a ring. This ring was specially designed for the customer. The center stone is green serpentine. The stone is wrapped with cooper wire. To give you an idea of the ring size, the center stone is about an inch tall. The entire ring was made from scratch. Even though the band is wire – it is rather comfortable to wear because the ends are hidden beneath the serpentine stone. If you would like a similar piece, or would like a unique piece jewelry, contact us! 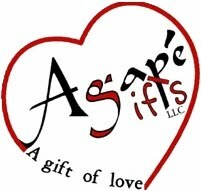 This necklace is one of Agape Gifts’ newest styles. The copper bowl-shaped saucers are hand pounded from a flat sheet of copper. The copper squares and circles in between the copper domes are made from square copper wire. Attaching all the copper pieces are sterling silver hand-made jump rings. The necklace is hung with bronze silk cording. 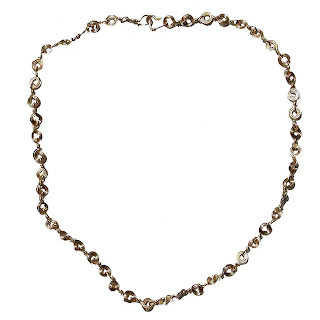 The silver bar on the bronze cord is a sliding clasp, which makes this necklace adjustable. If you would like a similar piece, or would like a unique piece of jewelry, contact us! 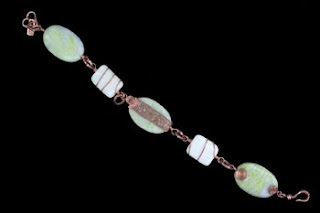 This decorative bracelet is made with sheen turquoise polymer clay and round iridescent white U.S. glass beads. This piece has lobster clasp w/ heart jump fastenings and findings. The twisted wire is actually a textured wire; it adds a certain texture to any piece of jewelry. Because we used Polymer clay, this bracelet is very light, but looks a little like turquoise. 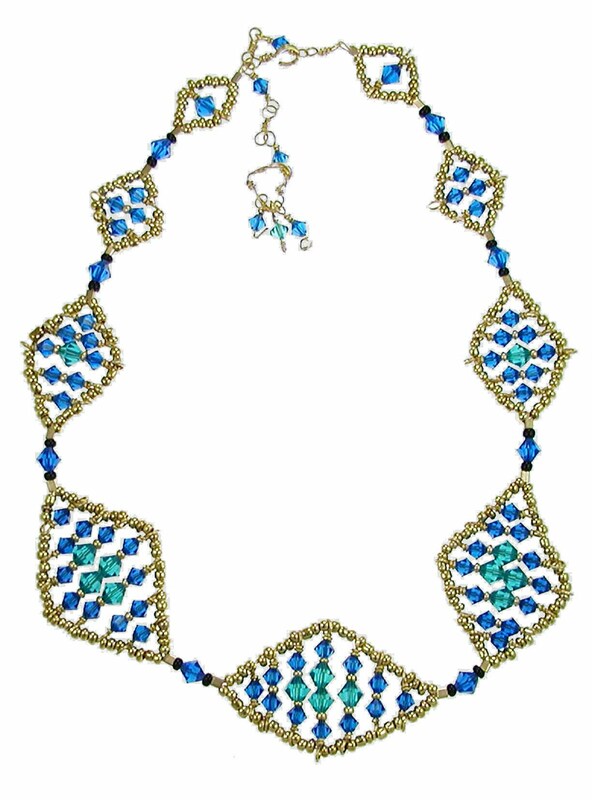 If you would like a piece similar to this one, or need a unique piece of jewelry, contact us! 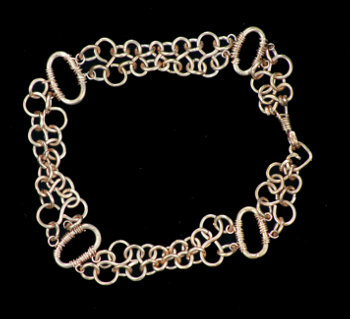 Today’s piece is a hand-linked copper bracelet. 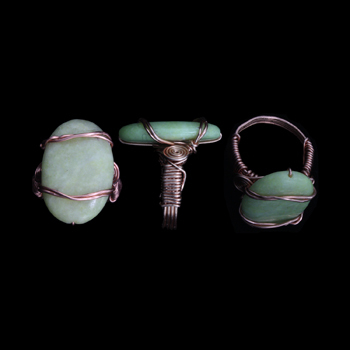 This entire bracelet started on one spool of copper wire – even the hook clasp was made from the spool. 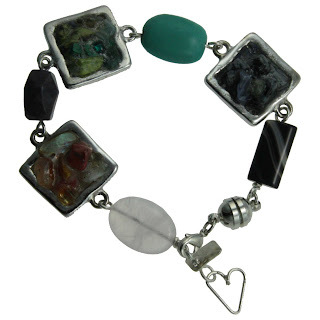 This bracelet uses a variety of wire gauge sizes to give the bracelet dimension. In between each of the ovals are five “figure 8” shapes that decrease, then increase in size, all connected with hand-made jump rings. 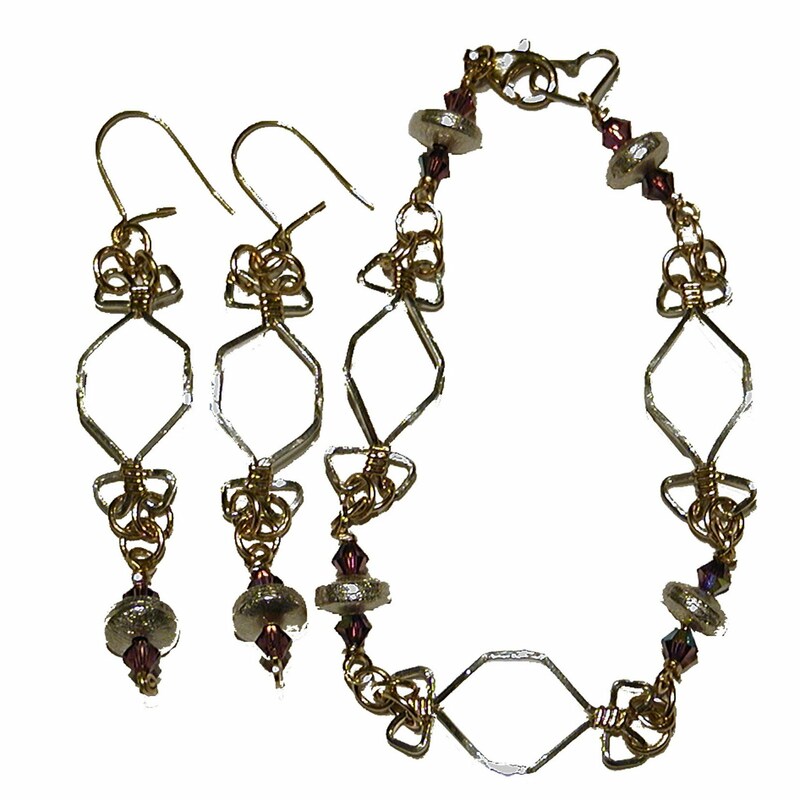 These middle sets are then adhered to the ovals with fine, 30gauge wire – strong, yet subtle. If you would like a similar piece of jewelry, or a unique piece of jewelry, contact us! This is a special-made piece that Laura just finished yesterday. The base of the bracelet is hand-knitted gold thread. The beads were then threaded throughout the knitted strip. 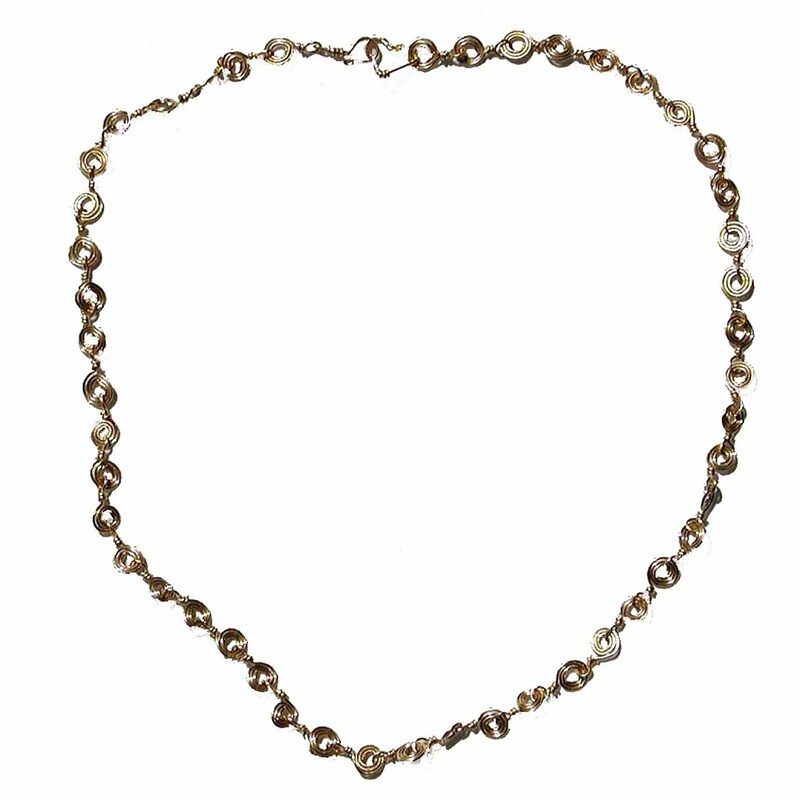 The beads that are threaded on the bracelet are pearls and two types of stone nuggets. 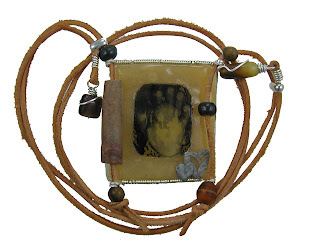 The center piece is an image of Our Lady that has been image-transferred onto a polymer substance. This bracelet also has a magnetic clasp, with a catch-chain in case the magnets come detached. This extra bit of security is very important, especially when a bracelet is as lightweight as this one. If you would like a similar piece of jewelry, or would like a unique piece of jewelry, contact us! 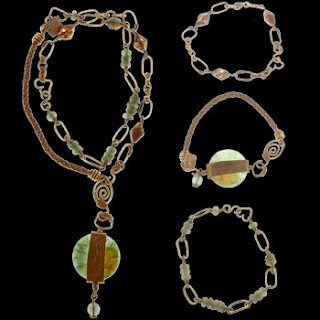 This Fusion Style Necklace & Bracelet is made with coin (flat round) crackled blue Botswana Agate, roundel wire wrapped gray labradorite and diamond red aventurine. It features copper handmade cording. This piece has handmade hook w/ heart jump fastenings and findings. This is an interesting piece, because, as you can tell by the image, the necklace is made from a medley of bracelets. The metal band across the coin medallion is hand-stamped to spell “Peace”. If you would like a similar necklace, or would like a unique piece of jewelry for a special occasion, contact us! Here is another new piece by Agape Gifts, just finished earlier this week. 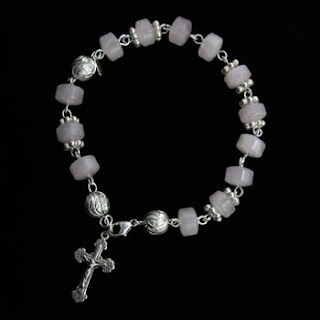 This Rosary Bracelet is made with roundel opaque pink rose quartz and round etched sterling silver. It features silver hand crafted chain. It looks chunky, but actually fits quite snug on the wrist, this is because the quartz roundels are so large. This piece is currently available. This is a new bracelet. Laura, our head designer, just finished it this past Friday. Each of the stones in the silver squares were separately hand placed. As always, the wire-work is hand twisted. Another unique feature of this bracelet is that it has both, a magnetic clasp AND a lobster clasp. The magnets are so strong that they can keep the bracelet together while using the lobster clasp. Since the bracelet has a lobster clasp, it is adjustable to ½”. This piece is available for purchase; for more information, e-mail us! If you need a unique piece of jewelry for a special event, contact us! 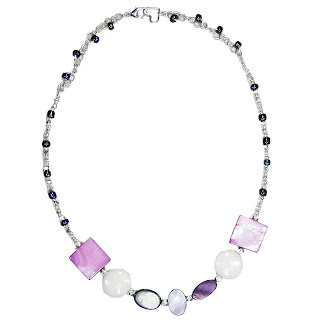 This piece is a specially made necklace. The customer approached me with a river rock she had from her childhood, and wanted to make it into a necklace. The ribbons add an airiness to the necklace, and the stones lassoed around the river rock add a nice color without being too flashy. If you would like a piece like this, or would like a unique piece of jewelry for a special occasion, contact us! Today’s bracelet is a hand-crafted masterpiece. 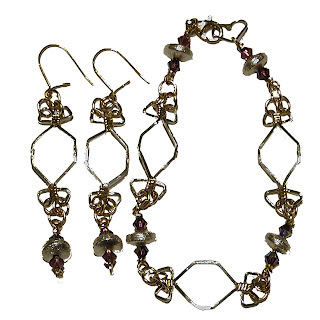 The bracelet and earring set is made with silver, gold, and purple Swarovski crystals. The hexagonal pieces and the large saucers are sterling silver. Keeping the hexagon pieces closed, and linking the whole bracelet together are pieces of gold wire. As expected, all the wire-work seen here is hand-done from a straight spool. The purple diamond beads are the Swarovski crystals. If you would like a similar piece, or need a unique piece of jewelry, contact us! Today’s piece is another ‘light’ necklace. The shells along the bottom add color without weight, which is always an added bonus. This necklace, as with all Agape Gifts pieces is hand twisted. All the small beads around the edge are on hand-twisted and hand-interlocked pieces of wire. The links along the top are also hand-made. Since the back of the necklace is fitted with links, it is also adjustable. If you would like a similar piece of jewelry, or need a unique piece of jewelry for a special occasion, contact us! This necklace is hand-made. It is all hand-twisted sterling silver wire. Each of the individual spirals started out as straight wire. This is a great piece for a casual occasion, and can withstand almost any wear and tear! 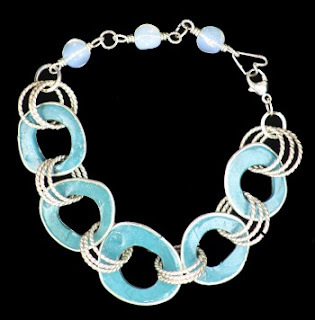 If you would like a necklace similar to this, or need a unique piece of jewelry for a special occasion, contact us! This necklace is not as flashy as a few of the other ones we have showcased for you in the past few weeks, but it is still interesting to look at. This gold-filled necklace is all wire, and hand-twisted of course! Each of the individual spirals started out straight wire. This is a great piece for a casual occasion, and is very durable! If you would like a similar piece of jewelry, or would like a unique piece of jewelry for a special occasion, contact us! This necklace is an interesting piece, not how it looks, but rather what it is made of. 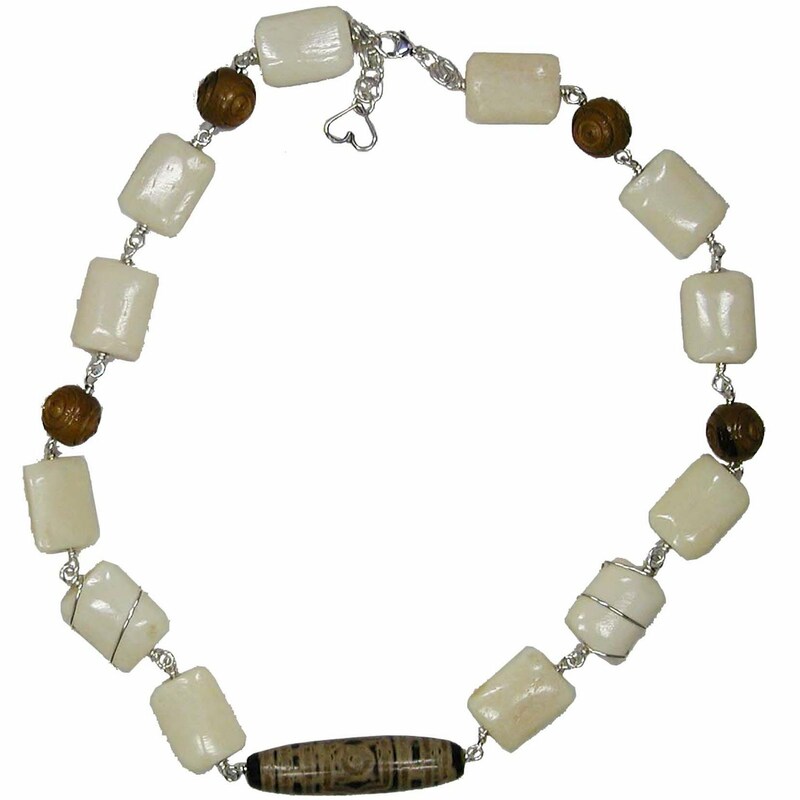 The white squares are buffalo bone, a lightweight, yet interesting stone. Two of the bones are hand-wrapped. The round balls are hand-carved wood. The oblong center stone is ceramic. 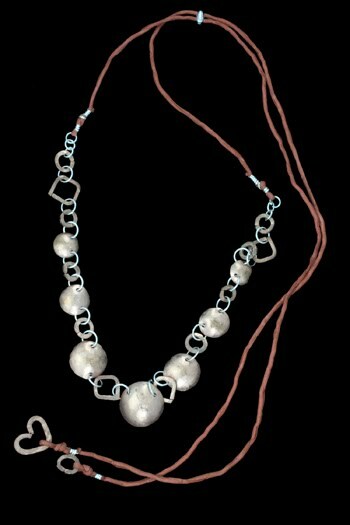 All in all, the necklace is rather light, and all held together with hand-twisted sterling silver wire. If you would like a similar piece, or need a unique piece of jewelry for a special occasion, contact us! 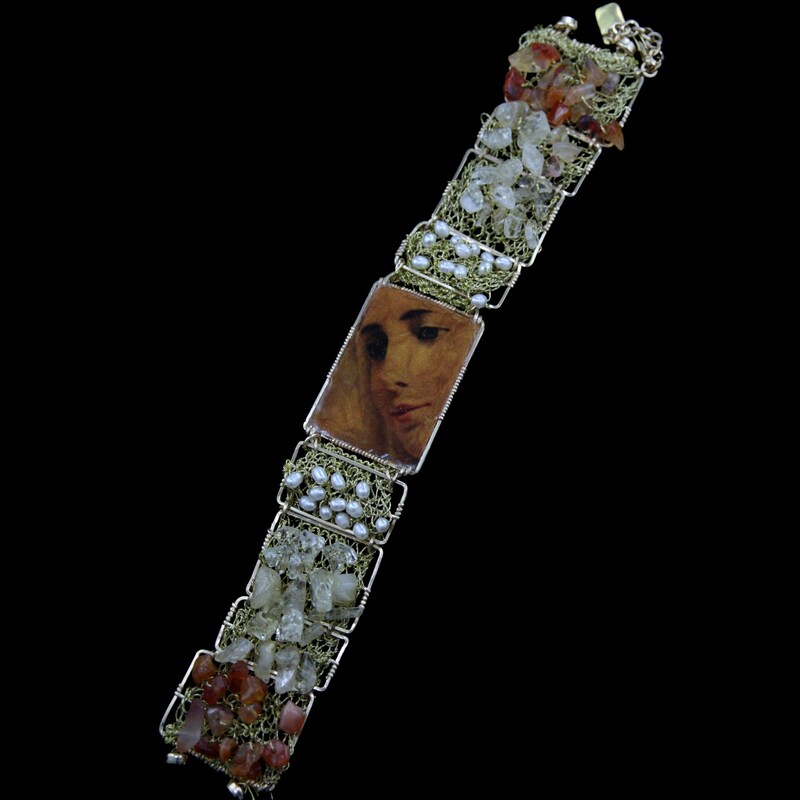 This was a fun, yet time-consuming bracelet to make, as are most of the delicate pieces. The wire used here is gold-filled round and gold-filed square wire. 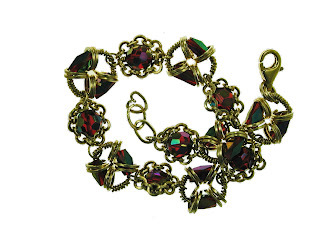 All the wire-work on this bracelet is custom hand twisted and the crimson Swarovski crystals have an Aurora Borealis film on them so they shimmer in any light. If you would like a similar piece of jewelry, or need a unique piece of jewelry for an event, contact us! This is a specially made piece. It was designed for a family member. On one side, it has their child’s handprint, and on the other side is the child’s image. 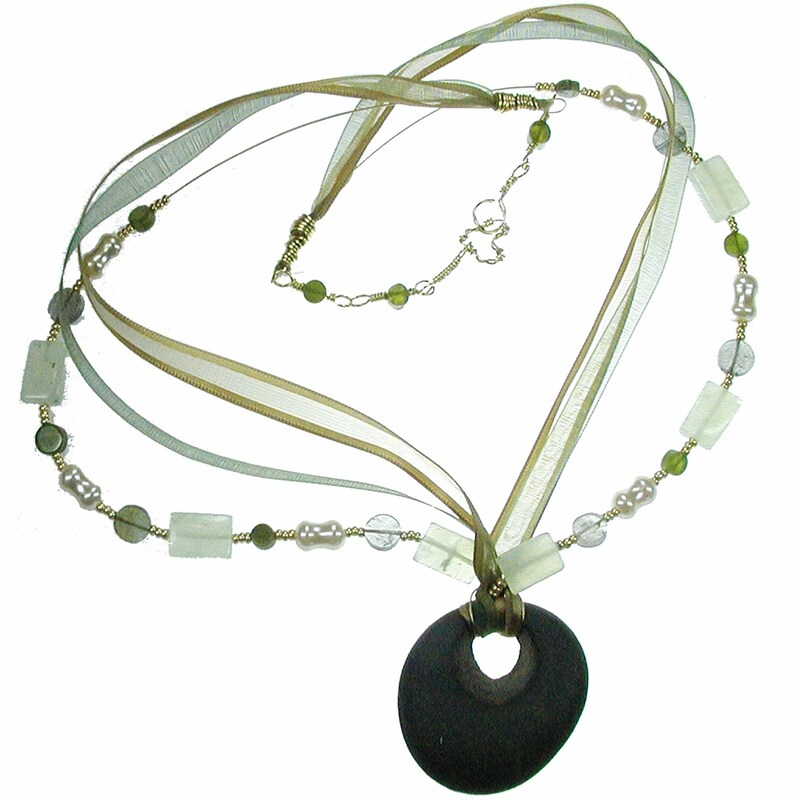 The center base is made of polymer and is strung on leather cording with hand-wrapped quartz beads. If you would like a piece similar, or are looking for a unique piece of jewelry, contact us! This was a custom-wire work bracelet. It was made with square sterling silver wire. 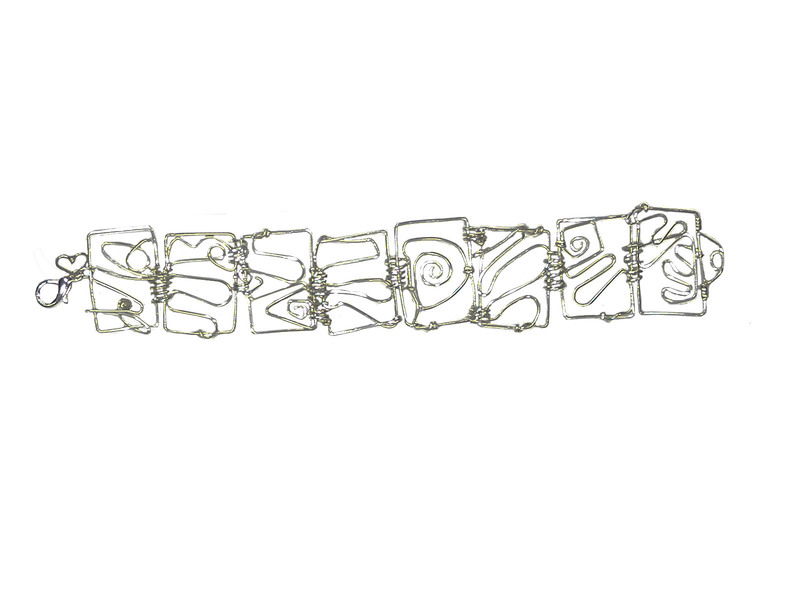 This bracelet, even though square, folds to form nicely around the wrist… another one of Agape Gifts’ “secrets”. Being a wire piece, there is not much story to go along with it. Each of the individual “rectangles” have only one piece of wire inside them, pretty cool, eh? If you would like a similar piece, or if you need a unique piece of jewelry for a special occasion, contact us! This piece here was a special order, drawings were sent back and forth during the design period - it is always a bonus when the real piece directly represents the drawings! The blue Swarovski crystals have an Aurora Borealis film on them which allow them to shimmer in any light, adding another dimension to an already stunning piece. Each of the crystals were hand strung on custom fitted wire… and the little gold beads, those were all meticulously counted and specially placed. It is the fine details though that make this necklace like no other! If you would like a piece similar to this, or need jewelry for a special occasion, contact us!